UN-Habitat Sri Lanka | Human Development Initiative in Nuwara Eliya District: Ground-Breaking Ceremony Held at Dayagama Estate to Build a Community Centre. 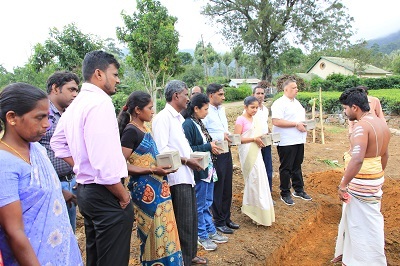 UN-Habitat Sri Lanka > News > HDI Project News > Human Development Initiative in Nuwara Eliya District: Ground-Breaking Ceremony Held at Dayagama Estate to Build a Community Centre. Human Development Initiative in Nuwara Eliya District: Ground-Breaking Ceremony Held at Dayagama Estate to Build a Community Centre. 20 June 2017, Nuwara Eliya District, Sri Lanka. A ground-breaking ceremony was held at Dayagama estate in Nuwara Eliya district on 20th June 2017 to commence construction activities for a Multi-purpose Community Centre. 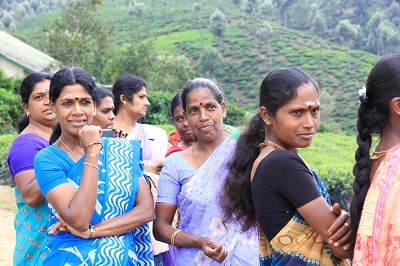 This initiative is funded by the Korea International Cooperation Agency (KOICA) through the project Human Development Initiative through Empowerment and Settlement Improvement in the Plantation Settlements in Sri Lanka. The project is implemented by UN-Habitat in close collaboration with the Ministry of Hill Country New Villages, Infrastructure and Community Development. Mr Saman Kumara, General Manager, Agarapathana Plantation Company, Ms. Surangi Perera, Assistant Commissioner of Cooperative Development, Nuwara Eliya, Community members, religious leaders and UN-Habitat officers actively participated in the event. Following the laying of the foundation stones, Hindu religious observances were held to evoke blessings on the initiative. The ground breaking ceremony was organized by the Dayagama West Estate Workers Housing Cooperative Society (EWHCS) and the Agarapathana plantation company. The construction work of the community centre has been undertaken by the EWHCS of Dayagama West with technical supervision by UN-Habitat. The multi-purpose community centre will be 2,500 square feet, consisting of a large main hall and three rooms. It will provide office space for government officers including the Grama Niladhari and Samurdhi officer and public health midwifes for the “mother and child” clinics. The main hall will be used for community meetings and other community gatherings including weddings. UN-Habitat plans to use environmentally friendly building materials and methods such as fair faced block work to construct the building. The building will include a rain water harvesting system. UN-Habitat is also planning landscaping and tree planting of the community centre compound to ensure a green and conducive environment. The HDI project is contributing towards human development through capacity building of youth, communities and local authorities; increasing resilience of the communities through settlement planning and community infrastructure; and through awareness creation towards mainstreaming plantation settlements. It is expected to benefit over 10,000 persons directly and 250,000 persons indirectly in Nuwara Eliya district. The project is being implemented from January to December 2017 in the Kothmale, Nuwara Eliya and Walapane Divisional Secretariat divisions. UN-Habitat Conducts Job Fair for Youth in the Nuwara Eliya District UN-Habitat Supports Disaster Risk Reduction Initiatives in Nuwara Eliya District with Funding from KOICA UN-Habitat Supports Plantation Communities to Obtain their Basic Legal Documents Ambassador of the Republic of Korea to Sri Lanka Officially Opens Community Infrastructure Initiatives Implemented by UN-Habitat in Nuwara Eliya District. UN-Habitat Improving Employability of Youth in Nuwara Eliya District with Funding from KOICA Human Development Initiative in Nuwara Eliya District: Ground-Breaking Ceremony Held at Dayagama Estate to Build a Community Centre. Construction of Permanent Houses for Estate Workers Underway in Nuwara Eliya District with support from the Government of India and UN-Habitat UN-Habitat launches the “Human Development Initiative through Empowerment and Settlement Improvement in the Plantation Settlements in Sri Lanka” Project in Nuwara Eliya District.